Hand-written from Nguyễn Ngọc Như Quỳnh, dated June 2, 2017, requesting a defense counsel. 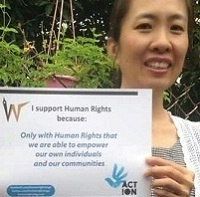 Nguyễn Ngọc Như Quỳnh, aka Mẹ Nấm (Mother Mushroom), is a prominent blogger and human rights defender. She was arrested on October 10, 2016 under Art. 88 (“propaganda against the socialist state”). She has not been allowed to see either a lawyer or her family since then.